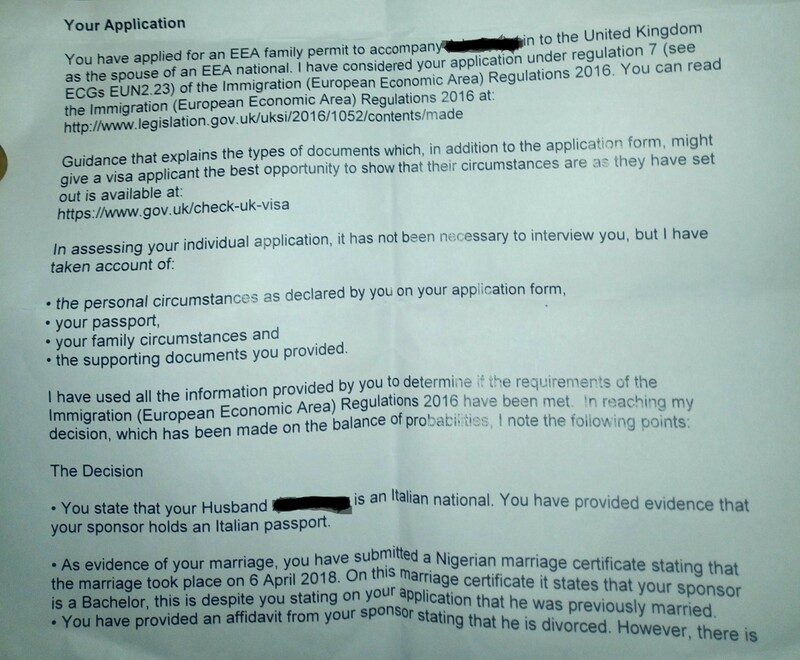 Please I need some advice, I just got my passport back and I was refused an EEA family permit visa to travel along with my husband and son who are Italian citizens, because I couldn't get the divorce papers of my husband's previous marriage that took place in 1998 and divorce in 2003. I included affidavit of missing divorce papers. My concerns are what do I do since we can't find the divorce papers? And secondly on our marriage certificate it's written 'bachelor, not divorced', and it was one of the reasons of refusal. Please what can I do to correct the marriage certificate, because while we were signing the marriage certificate they didn't ask if any of us were married before so we didn't even think it will be an issue. Photos from our traditional and court marriage, photos from our son's naming ceremony and some family pictures of us and our son. Whatsapp chat from when we started dating. Affidavit stating that the divorce papers were missing while moving from house to house. Please I will like to add that in my Nigerian passport I have a two years schengen visa, can we travel to France and then show them at the UK border our marriage certificate telling them am the spouse of an EU member and will like to enter the UK with my husband? Can I enter the UK through that means? The problems you are having stem from inconsistencies in the papers you have submitted for your husband. The ECO has concluded that there is sufficient doubt about whether your husband was free to marry you that he can conclude that you are quite possibly not legally married and therefore don't qualify for an EEA family permit. You need to gather all the paperwork relating to your husband's marriage and divorce, and correct the error on the Nigerian marriage certificate so that you have an accurate, complete and consistent record of your husband's marital status. Then you should apply again, explaining the nature of the problem and enclosing all the paperwork that demonstrates the actual situation. You might find using the services of a lawyer experienced in UK immigration is helpful here. I'm assuming that your husband was married and divorced in Italy. If not, you'll need to apply through the offices and courts in the relevant country. You can obtain a copy of your husband's previous marriage certificate from the Vital Records Office in the city where he was married. There are companies that offer to do this for you. Here's one I found through Google. I make no recommendations, and you may be able to apply direct to the registry. You will need to get copies of any court papers certifying your husband's divorce since clearly the affidavit wasn't enough. I'd expect you to be able to get these by applying to the court that issued them, although I'm not sure whether this is true for Italy. You might find some useful information on this page on WikiProcedure, but in any case the clerk at the court should be able to advise you on the correct procedure. Lastly, the registrar in the office where your marriage was registered can apply corrections. (See section 31 of the Nigerian Marriage Act). Any registrar, when authorised by the Principal Registrar, may correct any clerical error in any certificate of marriage filed in his office, upon production to him of the certificate delivered to the parties, and shall authenticate every such correction by his signature and the date of such correction. According to this you will need to return your marriage certificate to the office in Nigeria. You will need to contact that office to find out what documentary evidence they will need for the correction you are requesting. This will take some time. Good luck!